12.3 million homes could be powered by the current installed solar capacity in the U.S. The U.S. solar industry is growing at an unprecedented rate. In 2018 alone, the industry added more than 10.6 gigawatts of solar capacity. With more than 64 GW of cumulative solar electric capacity, solar energy generates enough clean electricity to power more than 12.3 million average American homes. Solar resources are abundant across the United States. The state of Alaska receives the same amount of irradiance as Germany, the world leader in PV deployment. But each state receives different amounts of sunlight, which ultimately impacts the amount of energy generated by a solar energy system. The chart below shows how solar energy system performance varies across different states. The National Renewable Energy Lab’s PVWatts PV performance estimation tool uses solar resource measurements along with weather and other variables to estimate a PV system’s energy production. PVWatts version 1 provides system performance estimates from more than 200 testing locations across the U.S. SEIA used averages from all testing locations in each state to produce a state average estimate. Electricity consumption varies significantly across all states due in part to differences in demographics, home size and characteristics, and weather. For example, a homeowner in a state like North Carolina–with hot, humid and long summers—uses more than twice as much electricity each year compared to a homeowner in New York State with shorter and relatively cooler summers. The chart above highlights the differences in electricity consumption per household across a sample of states. Megawatt-hours consumed annually per home (2017) were provided by the Energy Information Administration (EIA) using form 861. The average number of homes per megawatt of PV for a given state is simply the quotient of the average PV system performance estimate and the average annual household consumption. The graphic below outlines the homes/MW methodology for NY. This calculation was repeated for every state. 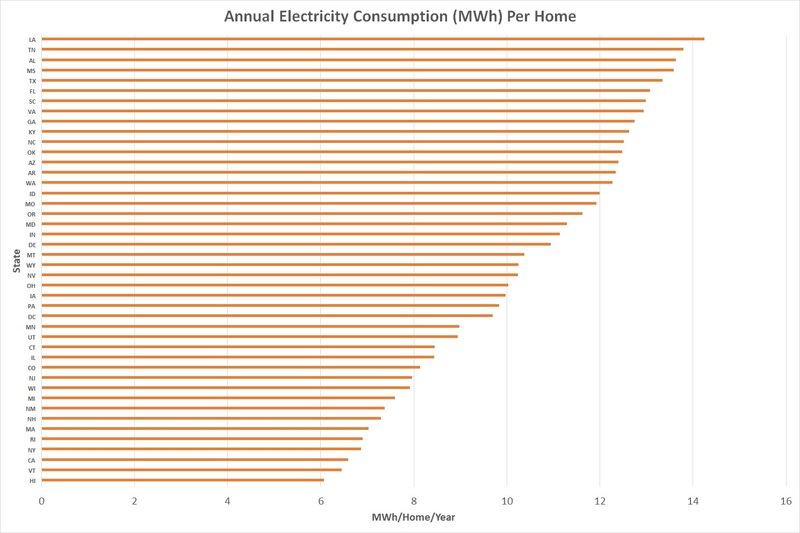 Due to differences in PV system performance and annual energy consumption per household, the number of homes powered by a MW of solar can vary significantly from state to state. The chart below shows the average number of homes powered by a MW of solar in some of the main solar markets across the country. The current national average (through 2018) of homes powered by a MW of solar is 190. Since SEIA began calculating this number in 2012 it has ranged from 150 - 210 homes/MW in line with the market share of system types and the geographic distribution of solar PV systems. As utility-scale systems have taken on a greater share of total PV capacity, it has put upward pressure on the homes/MW number because those systems generally have higher yields than rooftop systems. Conversely, as the solar PV market diversifies and California's share of total capacity decreases, downward pressure is applied to the homes/MW number because most states lack the balance of solar resource (insolation) and low humidity (resulting in relatively low cooling load) seen in California. As these and other trends continue to emerge, we can expect continued minor adjustments to the homes/MW number. 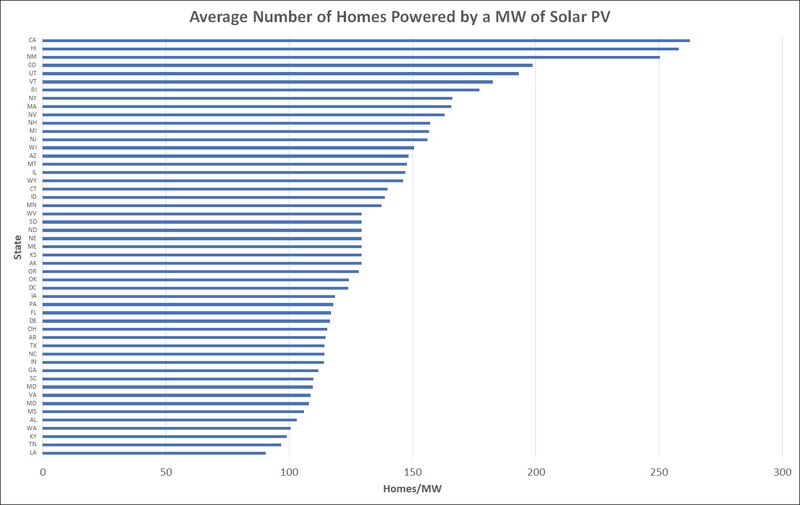 First, the total number of homes powered by PV within each state was calculated. The first step in calculating the total number of homes powered within a state was to determine the total output generated by PV. 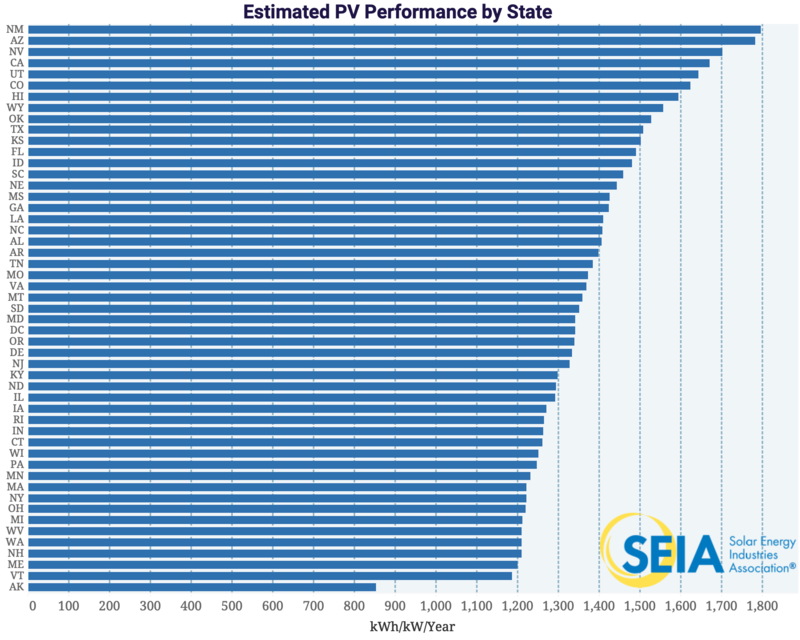 The total PV generation within a state is the product of the respective state’s average PV system performance estimate and cumulative installed PV capacity. Then, the total PV generation was divided by the average annual electricity consumption per household within the respective state. The quotient is the total number of homes powered by PV within the state. The flow chart below outlines the step-by-step process used to calculate the total number of homes powered by PV in New York. This process was repeated for all 50 states. Once the total number of homes powered by PV was calculated in every state, the totals were summed to show the national total number of homes powered by PV. The national total was then divided by the national cumulative installed PV capacity. The quotient is the national average number of homes powered by a MW of PV. The flow chart below outlines the final step in the methodology. Standard PV panel capacity is measured in direct current (DC) watts under Standard Test Conditions (STC). As such this is the way the industry typically tracks product volume. The DC output from panels must be converted to alternating current (AC) before being put to use in a home or distributed on the electric grid. Large, utility PV, CPV and CSP plants typically report their capacity already converted to AC watts.